The CIT Sustainable Skills Training Hub is a four storey educational facility comprising of classrooms, workshops, multi-purpose laboratories, plantrooms and a lecture theatre. In all facets of design, the building targets environmental sustainability and has been registered as a 6 Star Green Star Education Facility. The new building will provide a purpose built facility at the Bruce Campus for hands-on green skills training in emerging sustainable technologies for both residential and commercial construction sectors. Students will be trained in the installation, testing, commissioning and maintenance of these technologies to gain the skills required to assess and employ the latest in green building applications, materials and new products. The structure utilises precast concrete and steel construction containing high levels of recycled content with a majority of the external facade being constructed of Kingspan panels for increased building insulation. This Kingspan in conjunction with the CF210 slab formwork also assists with limiting internal linings and reducing building structure. Incorporated into the structure and to facilitate natural ventilation and services mains, a series of thermal shafts have been included creating a central spine to the floor plan. Internally, the building finishes have been kept to a minimum with a large percentage of recycled materials being used, including timber, plasterboard, rubber flooring, carpet and bricks. In limiting the ceiling linings, recycled timber battens have been used to partially conceal services while main services runs have been left partially exposed to allow students to study them. The building incorporates numerous mechanical systems (for both building function and training purposes) which, during construction, involved extensive coordination and precise workmanship, particularly in the associated pipework and control systems. 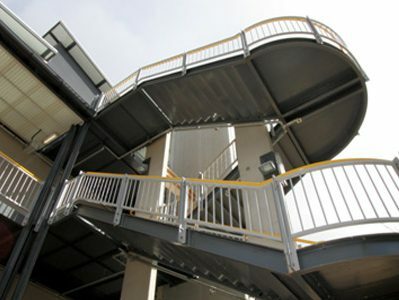 Access to the builing is achieved via external steel walkways and stairs, a lift service, as well as a two level link bridge connecting the building to an adjacent Campus building. This inside out arrangement allows students to also study how a building is constructed giving them access to view building details. A range of state-of-the-art mechanical technology establishes a rating of energy efficiency that leads the local and national industry. Fitted with sustainable technologies including; grid-connected solar photovoltaic and wind power generation, tri-generation micro turbines, absorption chillers, solar hot water systems, ceramic fuel cells, bio-fuel boilers, gas-fired condensing boilers, geothermal cooling and chilled beams, the building creates far more energy than it requires and therefore exports excess power to the grid. All mechanical elements are fully automated and in conjunction with the actuated windows, transforms the building into a living, breathing, environmentally sustainable machine. The building is fitted with an automated lighting control system which senses movement, activating lights to certain parts of rooms, in conjunction with non PVC rated cabling and high efficiency lights and fittings – even the electrical component of this project contributes to the high standard of environmental sustainability. The building also utilises four types of water; fresh water; rain water captured from roof’s and awnings; bore water from the on-site ring main; grey water and black water collected in a biolytix filtration system tank which effectively purifies sewer from toilets and basins for sub-soil irrigation purposes. When rated, the building will potentially become the first new building in the ACT to achieve a 6 Star Green Star design rating and the only 6 Star educational facility. The CIT Sustainable Skills Training Hub is to be entered into the 2011 Master Builders and Boral Excellence in Building Awards – Environmental Category. The project will also be entered into the 2011 ACT Sustainable Cities Awards under the Buildings and Gardens – Commercial Category; Environmental Innovation & Protection; Water Conservation; and Energy Innovation.